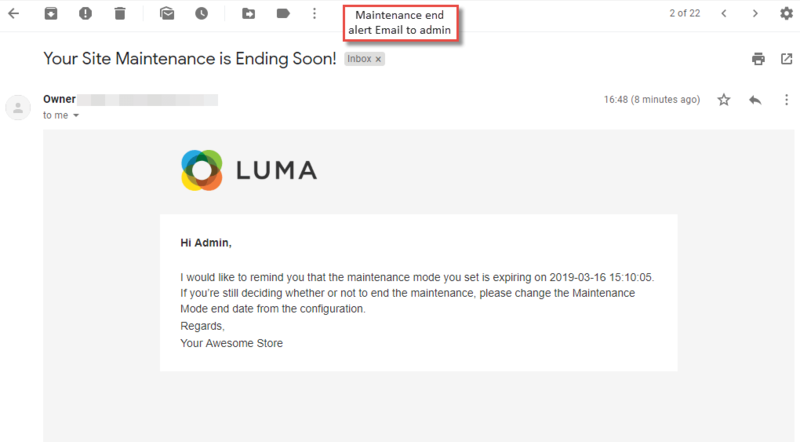 Magento 2 Maintenance Page extension allows showing a user-friendly notice to your users during the website is in the maintenance mode. Easily enable Magento 2 maintenance mode. Display a count down timer on the coming soon page. Add an image, video, subscription box etc. to the Magento 2 maintenance mode page. It's never too late to collect leads! Sometimes, you want to enable maintenance mode in Magento 2 website for the reasons like, setting up a new theme, configuring a new extension that changes website behavior, upgrading Magento 2 versions, making minor cosmetic tweaks, fix a security flaw etc. Simply enabling the maintenance mode shows users broken website for the period of time. Rather, showing a user-friendly notice, alternative links to visit, showcasing the time frame when the maintenance is over creates a better user experience and positive brand image. In another scenario, if you have three days or three weeks left to launch your product or business, you can build an audience who is eager for your masterpiece to go live! Here, you want to put your website in an under construction mode and create hype for the upcoming products and services. Creating such a buzz is possible with Meetanshi's Magento 2 Maintenance Page extension for Magento 2 store. It allows admin to switch their store to maintenance mode or coming soon status. The Magento 2 Coming Soon & Maintenance Page extension help store owner to promote their products or services before they go live and create interest among potential customers. Also, it helps establish SEO ground for the brand and specific keywords. The extension allows adding photos, videos to the maintenance page that attract viewers to explore them. Adding a countdown clock with the extension help visitors know when the maintenance would be completed and they can revisit your store. Also, adding a subscription box helps grow your subscribers' list and notify them when the website is live again. With Magento 2 Maintenance Page module, not only boost the market talk but also make your social media networking strong by adding social buttons on the Magento 2 maintenance mode page! Switch the store to maintenance mode. Set up whitelist IPs for the convenience of testers or developer team. Set the list of allowed URLs for which you do not want to enable the maintenance mode. Select the page you want to redirect the visitor from the backend dropdown menu. Admin can select one of the three templates and layout from the dropdown. Option to choose custom design option to design a custom maintenance page. The backend option to preview the maintenance page. Enable a countdown timer for the site to switch back to live mode. Set the custom title and title color for the countdown timer. Admin can set the date and time to end the countdown timer and also the option to disable the maintenance mode at this time. Options for the countdown timer style. Option to set the logo with custom dimensions. Add pictures, sliders or videos in the Magento 2 custom maintenance mode page background to make it attractive. Display a message with custom title and text on the maintenance page using a WYSIWYG editor. Add a subscription box to grow your subscribers' list and collect maximum emails from the maintenance page. Admin can set a custom title and its color for the subscription button. Add social media buttons with custom title and title color to communicate and engage with potential customers on social media. Social Media Buttons that can be included are Facebook, Google+, LinkedIn, Twitter, YouTube, Instagram, and Pinterest. Set custom footer text easily using WYSIWYG editor. Admin can set the option to receive an Email when the Maintenance mode ends before a fixed number of days. Set the Email ID on which the Email is to be sent. Select the Email sender and template. Option to integrate Google Analytics using the tracking ID on the maintenance page to track and analyze the useful data. Avail maximum SEO benefit for the relevant keywords ahead of time.